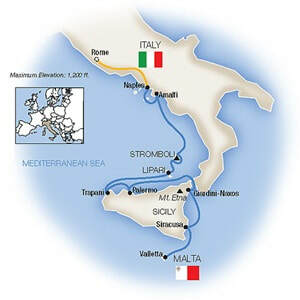 Sicily, the Amalfi Coast & Rome. 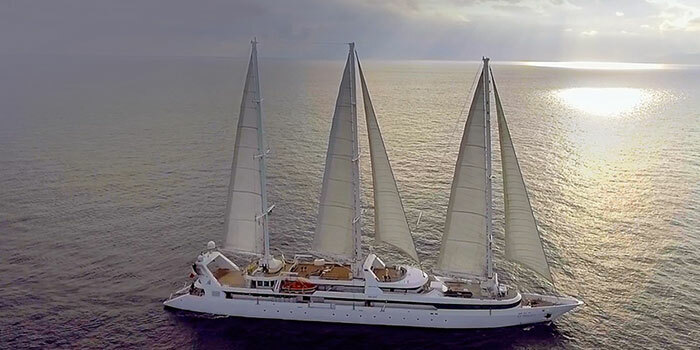 There's no better way to cruise Italy and Sicily than aboard the three-masted yacht Le Ponant, on a 7-night voyage plus one night on Malta and two nights in the heart of Rome on the fabulous Via Veneto – featuring a Tauck Exclusive, an after-hours visit to the Vatican Museums. Travel to the Mediterranean coast for a visit to the ruins of Herculaneum. The eruption of Mt. Vesuvius in 79 AD is infamous – and while the ruins of famous Pompeii are well known, those of the upscale city of Herculaneum, buried under ash that same day, are better preserved. You can explore today on a guided walk in Amalfi, including a drive on the mountainous route along the Amalfi Coast, one of the most spectacular drives in the world. Arrive in stunning Ravello, perched on cliffs overlooking the sea. Visit Villa Rufolo, with roots dating back to a wealthy 13th-century merchant family, where you'll savor outstanding coastal views, then enjoy a wonderful lunch of seasonal specialties in town. Visit ancient Segesta where antiquities include the unfinished temple encircled by 36 massive Doric columns, which was started in 426 BC and is remarkably preserved. Wake up docked in Sicily’s capital city of Palermo for your choice of guided shore excursions. One choice takes you to visit the domed Cathedral of Monreale, a UNESCO World Heritage Site and the pearl of Arab-Norman art and architecture, followed by a visit to a family-owned vineyard for a tasting tour.illas. If Mafia lore sounds intriguing instead, choose our walking tour of Palermo with an anti-Mafia Addiopizzo activist; you’ll see places where merchants and residents are defying Mafia muscle.